You know that you'll only get better at hitting if you practice. So having hitting drills you can work on will make your practice much more fun. It will also help you work on the various parts of the swing by using a specialty drill that isolates one part of your swing. This video covers all kinds of hitting drills from one of the top baseball coaches in the country. It features a comprehensive set of proven developmental drills that are designed to enhance the key components of sound hitting. In an easy-to-understand and apply style that is appropriate for players and coaches at all competitive levels, the DVD explains and shows how to properly perform each drill. Among the hitting drills included are towel bat; power trigger; pro cut; seeing the ball; flat bat; inside pitch; strike zone; hit stick; lad bat; reverse grip; split hand; heavy ball; inside-outside; curveball flip; bottle cap; drop ball; mojo; and thunder stick. Rod Delmonico is currently in his 17th season as the head baseball coach of the University of Tennessee. Last year on March 11, 2005 he won his 600th career game as UT's head coach. Each of his Volunteers teams has exhibited an explosive offense, finishing in the top four in batting average 10 times, including a league leading .340 average in 1998. 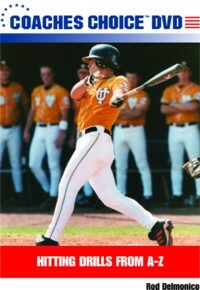 Delmonico has seen 86 Vols sign professional baseball contracts including six first-round picks. In fact, over the last 24 years at the Division I level, he has coached or signed 28 players who went to play in the major leagues, including the likes of Todd Helton, Joe Randa, Jimmy Key, Luis Alicea, Deion Sanders, Paul Sorrento, and most recently, Chris Burke of the Houston Astros. This DVD was produced this last year, so get the video today and have your players and team start their way to explosive hitting. Get all of Coach Delmonico's coaching knowlege about the offense and save $20 in the process! He has created 2 other DVD's.